Make your building stand out in West Hollywood with Concrete Vent Blocks built to your unique specifications. Since 1965, Atlantic Coast Precast has been proud to work closely with designers, engineers, architects, contractors or other industry professionals to cast custom products made from their unique samples, specifications, and sketches. Call for a FREE quote to get started with yours, today. 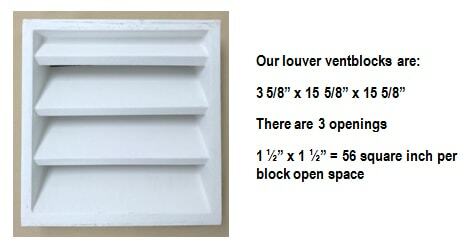 Our two-piece functional vent blocks, also called breeze-blocks or pattern blocks are designed to allow fresh air and light to pass through while debris, rain, and heavy winds are kept at bay. In West Hollywood, concrete vent blocks are naturally cooling and great for large commercial spaces like parking garages and warehouses, or residential foundations and crawlspaces because they allow moisture to escape and will prevent the growth of mold and mildew. By casting your precast concrete vent blocks in our factory nearby and delivering them at your site for easy and speedy installation, we can help you reduce your costs and save construction time. Precast concrete is smart and reliable for West Hollywood concrete vent blocks because they are maintenance free, easy to personalized, sustainable, and cost-effective, too. We can offer a range of colors, styles, shapes, and sizes to choose from. Call Atlantic Coast Precast, today!